We would like to invite everyone to the Opening Night at Blue Ball Barn in Wilmington, DE where the artwork will be on display from May 4th through June 1st. The Opening Night will be on Friday, May 4th from 5:30PM – 8:30PM for our Meet the Artist Event. This is an opportunity for the public to explore UD’s research and get to learn the science behind these incredible images for free! This year’s opening night is going to be very exciting with live music, prizes, and food! The Blue Ball Barn will be hosting their own Foodie Friday event, so it’s bound to be an incredible night of art, science, and food. 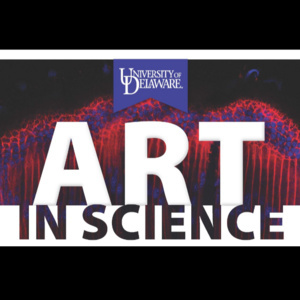 Art in Science is geared toward highlighting the cutting edge research at the University of Delaware that spans all disciplines in order to educate and engage the local community and spark interest in STEM activities in underrepresented student populations. We anticipate that engaging and educating the local community, through art, about the research taking place at the University of Delaware and its potential impact on local, national, and international communities will instill a sense of pride and connection between the University of Delaware and local residents. We were very excited seeing all of the images submitted this year – we had over 100 images submitted from over 10 departments including entomology, fashion and apparel studies, biological sciences, biomedical engineering, marine science, plant and soil science, anthropology, and more! The Address for Blue Ball Barn in Wilmington, DE is 1914 W Park Dr, Wilmington, DE 19803. This is right off of 202 near the intersection of 202 and I-95.